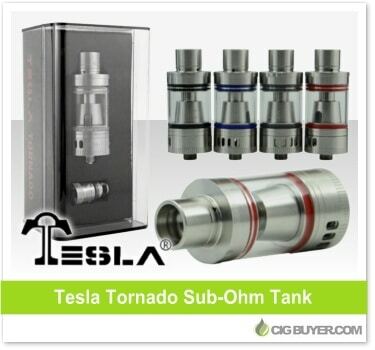 The Tesla Tornado Tank is the latest sub-ohm tank system from Tesla; featuring a unique top fill design and tons of airflow for producing massive clouds of vapor. Although it’s short in stature, it will fit nicely on virtually any mod and holds plenty of e-juice (4ml) with adjustable airflow holes on the top and bottom. Eight e-liquid inlets ensure fast wicking, and it’s compatible with a standard 0.4 ohm replaceable coil, as well as a 0.2 ohm Ni200 coil for temperature control vaping.